Following closely on Wyrd Sisters, the trio of witches - viz., Granny Weatherwax, Nanny Ogg, Magrat Garlick - are still about, this time they have to take on a Fairy Godmother - the "good" one at that! Fairy Godmothers apparently are found in complementary pairs - a good and a bad one. When one of the pair passes away, she appoints a suitable replacement to maintain balance before she leaves, to carry the wand, so-to-speak. Stories exist independent of their players. Stories, great flapping ribbons of shaped space-time, have been blowing and uncoiling around the universe since the beginning of time. And they have evolved. Stories etch grooves deep enough for people to follow in the same way that water follows certain paths down a mountainside. And every time fresh actors tread the path of the story, the groove runs deeper. This is called the theory of narrative causality and it means that a story, once started, takes a shape. With a page2-3 narration like that, how can you set the book down without reading till finish?! The book is about fairy tales having a life of their own, and about a fairy godmother who likes it that way and wants to enforce Happy Endings even if it kills. The Fairy Godmother pair in this case happen to be Desiderata and Lilith. Desiderata is one of the compassionate ones who took fairy godmothering so seriously that they were afraid to do good for fear of doing harm and would constipate themselves with moral anguish before granting the wish of a single ant. Lilith, her counterpart, on the other hand, had no such qualms. Desiderata's time had come, so she appoints Magrat as her successor and just to make sure the green and wet hen Magrat has some help, Desiderata clearly states that Granny Weatherwax ought to stay away, knowing full well that if you tell Esme Weatherwax she's got to go somewhere, she won't go out of contrariness, so, tell her she's not to go and she'll run there over broken glass. Drawing from multiple sources like classic literature, religion, mythology, pop culture, movies, fairy tales and even quantum physics, Pratchett parodies anything and everything in his inimitable style that masterfully combines deep insight with perfect comic timing. While the primary take is on Cinderella (Emberella, in this case), Pratchett combines many popular stories weaving them in to take a life of their own. Now, having seen Shrek the movie (2001) first before I read this book, the idea of fairy tales getting parodied was not entirely novel to me. 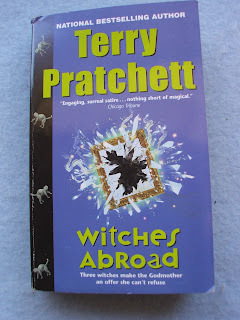 But, the elements, the characters, and the twists that Pratchett presents in this book are unique and refreshing. ...(people) started getting interested in the chaos itself - partly because it was a lot easier to be an expert on chaos, but mostly because it made really good patterns that you could put on a t-shirt. And instead of getting on with proper science* scientists suddenly went around saying how impossible it was to know anything, and that there wasn't really anything you could call reality to know anything about, and how all this was tremendously exciting, and incidentally did you know there were all these little universes all over the place but no one can see them because they are all curved in on themselves? * Like finding that bloody butterfly whose flapping wings cause all these storms we've been having lately and getting it to stop. The point was that a good German cook could more or less take the squeezings of a handful of mud, a few dead leaves and a pinch or two of some unpronounceable herbs and produce a meal to make a gourmet burst into tears of gratitude and swear to be a better person for the rest of their entire life if they could just have one more plateful. Occasionally a few bubbles would eructate to the surface like the ghosts of beans on bath night. Greebo broadcast a kind of greasy diabolic sexuality in the megawatt range. Underneath the table Greebo dozed on his back with his legs in the air. Occasionally he twitched as he fought wolves in his sleep.